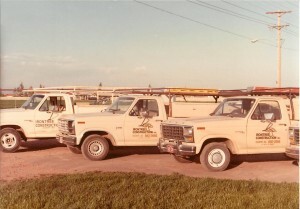 In 1978, Gary Williams a manager with Flour Corporation, resigned his position and made the move from Southern California to the Phoenix, Arizona area with the plan to form a general contracting and development firm. His dream was to develop and build strip shopping centers. Because of the transient quality in the Phoenix area, Gary was not able to obtain financing to complete his first project – in central Mesa. In the meantime, Gary’s wife Helen (and eventual partner in Irontree) a teacher for the Mesa School District, met another wife of a Phoenix area contractor. And as it happened, his company had just had a plumbing subcontractor default on a project. Gary (as a plumber for over 20 years) was asked to complete the work. And his successful completion of this project led to more work from this contractor and from others. Seeing an opportunity, Gary made the decision to continue Irontree Construction and Development, Inc. as a Plumbing Subcontractor. By hiring his first employee, Jerry Wood (still an employee today) in October 1979, it cemented the path. He and Helen developed several contacts within the Industry that by 1981, Irontree had eight employees and was close to $1M in annual revenues, while still working out of the Williams home office. By 1981 Irontree’s first office was opened with the addition of Marj Weber as Office Manager (Marj is still with Irontree and is now CFO and Treasurer). During all of those years, Gary and Helen included their children, Greg and Lori as integral participants in the business. Greg worked with Gary in the field from the beginning and eventually moved up the ranks to project foreman then project manager, VP of Operations, and finally President. Today Greg is 100% Owner of Irontree carrying on the legacy his father left. Lori began working for Irontree as an office assistant at 17 and today she is the Accounting Manager for Irontree, as well as Owner and Partner in the other investing companies of the Williams family. Though Gary suffered a debilitating stroke in 2011 and passed away on November 1, 2013, the company he founded continues to live on in his children, grandchildren, and hopefully great-grandchildren.